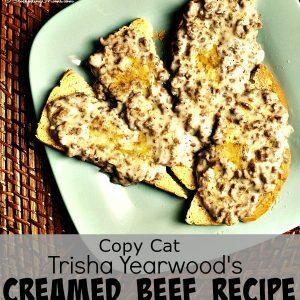 This Copy Cat recipe of Trisha Yearwood's Creamed Beef is so yummy and can be made in less than 30 minutes. Saute the beef in a large skillet over medium heat, breaking it up with a wooden spoon and cooking until it is no longer pink, 12 to 15 minutes. Drain off the excess fat and sprinkle the meat with the flour. Stir and cook the beef and flour over medium heat until the flour has completely coated the beef and cooked slightly. Stir in the milk and continue to cook until the mixture becomes smooth and thickens, about 8 minutes. Top with a pat of butter.